In April, a set of voluntary guidelines for air tours in Denali National Park was released, meant to minimize noise intrusions on backcountry hikers. An Aircraft Overflights Advisory Council spent a bit over a year coming up with the proposals, which included asking pilots heading for the summit of Mt. McKinley/Denali to avoid two high-altitude camps used by people climbing the mountain. 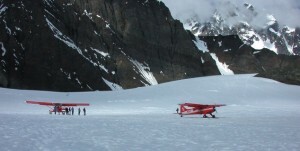 A “sound station” on the Ruth Glacier is monitoring the noise level of aircraft landing on the glacier. NPS Photo. A study commissioned by the Royal Society for the Protection of Birds (RSPB) found that many species of birds avoid nesting in areas within 500 meters of wind turbines. The RSPB, like its US conterpart the Audubon Society, has been largely supportive of wind energy. The new study was the most detailed yet of bird distribution around wind farms: twelve major upland wind farms were surveyed six times during the breeding season for a dozen common species including waders and gamebirds (golden plover, lapwing, curlew, snipe, red grouse), raptors (buzzard, hen harrier, kestrel), and songbirds (skylark, meadow pipit, stonechat and wheatear). Of the 12 species studied, 5 seemed undisturbed, while populations of 7 were 15-53% lower when within 500m of a wind turbine. The displacement effects continued out to a distance of about 800m (roughly a half mile). The affected species were buzzard, hen harrier, golden plover, snipe, curlew, wheatear and meadow pipit. It is crucial to note that this study was looking at nesting patterns, and does not suggest that birds are being killed by the turbines, but rather that they avoid nesting near them, presumably because of increased noise, which could disrupt communication between birds or reduce the amount of prey and make it more difficult to hunt (whether for insects or rodents). UPDATE: I recently came across a paper from last year that found no obvious avoidance of wind farms by most wintering species of UK farmland birds. This paper looked not at nesting patterns during breeding season, like the paper above, but rather at wintering birds’ presence (they walked randomized paths, and counted birds seen; most were seen when flushed from the grain). Looking at numbers seen in 5 sets of distances (from 0-150, to 600-750m), wintering farmland birds (seed-eaters, corvids, gamebirds and Eurasian skylarks) showed no increase with increasing distance. A further investigation of 0-75m and 75-150m also showed no trend. Only pheasants showed a tendency to be found in the segments further from turbines. 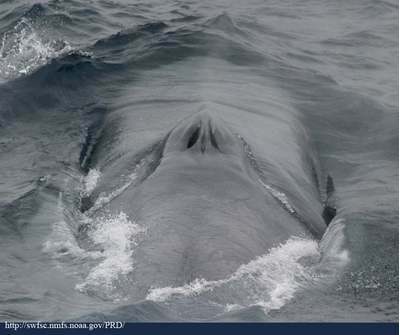 A new study published in Biological Letters found that a seismic survey in wide bay at the mouth of the St. Lawrence Seaway caused blue whales feeding and socializing nearby to double or triple their call rates. The calls were near-range communication signals, rather than the long, loud songs that are heard over hundreds of miles. The research was meant to simply learn more about these social calls, but during the study, their recordings began to pick up the pulses from a seismic survey. “The whales made more calls on days when the testing was happening. It seems they are having to repeat themselves in order to not lose information,” said lead researcher Lucia Di Lorio. They also called more on survey days when the sounds were not audible than when they were, and tended to rapidly increase calls when the sounds appeared. As the extended public comment period expired for input into the Obama administration’s approach to offshore oil and gas exploration, public pressure mounted to take a time-out on plans for expanded development in Alaska’s offshore waters. During the Bush administration, the Minerals Management Service began planning for offering new leases in the Beaufort Sea (north of Alaska), Chuckchi Sea (northwest of Alaska, north of the Bering Strait) and in Bristol Bay (north of the Aleutian peninsula). Native groups and environmentalists have expressed concern about noise impacts on sea life during exploration, and risks to the fragile ecosystem should full-scale development proceed. Signatures from 300,000 people supporting a halt in new leasing and drilling were delivered to the Department of Interior in DC, and a letter signed by 400 scientists urged the administration to “take a time out from offshore industrial activity to allow for a precautionary, science-based approach that better assesses the consequences of development in a rapidly changing ecosystem.” One of the key arguments made in recent years has been that the Arctic environment is changing rapidly in response to global warming, and that further stressing habitats with oil and gas development is ill-advised. “We still have a chance to do it right in the Arctic. All we’re really asking is that for once we look before we leap,” said Jeffrey Short, Pacific science director for Oceana and former National Oceanic Atmospheric Administration research chemist. That means taking a precautionary, science-based approach to oil and gas development, including assessing environmental impacts before issuing permits, sustained monitoring and comprehensive planning to determine the best way to proceed, the scientists say. After eight years of struggling to bring conflicting interest groups together to support a consensus alternative for managing air tours at Grand Canyon National Park, an FAA-organized Grand Canyon Working Group has adjourned indefinitely. The Working Group included NPS, FAA, tribal, environmental, and aviation industry representatives. At the Working Group’s last meeting, in late June, the GCWG disagreed on NPS alternatives, including a seasonal shift in air-tour corridors by alternatively closing the Zuni and Dragon corridors, which are now open concurrently. According to a recent article in Aviation International News, “The FAA does not have a role at this point,” said Lucy Moore, the GCWG mediation facilitator, adding “When the NPS presents one preferred alternative, the FAA will then review it for safety issues.” In recent years, the NPS has clarified its goals to meet congressional mandates to “substantially restore” natural quiet in the canyon; they are aiming to have half the canyon be free of air tour noise 75% of the time, though high-altitude jet flight will not be regulated. The Park Service is aiming to release a draft EIS in 2010; see their overflights web page for more details. At the June Working Group meeting, participants noted that the Park Service seemed more engaged and prepared to push for protecting natural quiet than during the previous administration; however, it is unlikely that the NPS plan will have as dramatic an effect on reducing air tour noise in the canyon as did an August visit by the First Family, when dozens of air tours were grounded for much of the day during a peak visitation period. Following up on concerns expressed by locals near the Mars Hill wind farm, and preliminary studies done by a local doctor, the Maine Medical Association overwhelmingly approved a formal resolution that stresses “a need for modification of the State’s regulatory process for siting wind energy developments,” in order to reduce controversy and incorporate the latest evidence-based research results. The statement urges the Department of Environmental Protection and Land Use Regulation Commission to refine their procedures to reflect potential health effects, and to concertedly explore these effects, and calls on the MMA and doctors to work with regulatory agencies to provide what scientific information is available (scroll down at link above to read the final resolution wording). Two weeks earlier, the MMA’s Public Health Committee had rejected the proposed resolution, which many members felt was worded more strongly than current evidence would support; the resolution was slightly re-worked, and met with approval at the MMA’s annual session. One of the resolution’s sponsors, Dr. Michael Nissenbaum, MD, is in the midst of completing a study of the residents both near the Mars Hill wind farm, and those further away, in an attempt to assess any significant differences. The first part of his study (centered on interviews with wind farm neighbors) is available now, with the second part (similar interviews with residents out of earshot) still underway. A two-part radio interview with Nissembaum is available here. A two-part local news feature on the Mars Hill controversy is available here. Ongoing research by NOAA’s Northwest Fisheries Science Center continues to look more deeply into the effects of boat noise on Puget Sound orcas. The research team, led by Marla Holt, had previously found that orca calls increase in volume in step with background boat noise: for each decibel of added background noise, their calls also got a decibel louder. In their latest round of research, the team is trying to determine whether the background noise is diminishing their foraging success due to masking (drowning out) some of the critical group communication, and whether calling louder makes the animals use more energy. A 20% population decline among the Southern Resident orcas during the late 1990’s has been attributed to a combination of fewer salmon, toxins, and vessel noise. According to a recent article on National Geographic.com, Holt, who will present the team’s preliminary findings in October at the Biennial Conference on the Biology of Marine Mammal in Quebec, said that their research indicates killer whale communication is particularly important during hunting. What’s more, previous studies in birds had suggested that the animals consume more oxygen to raise their voices above ambient noise, making their metabolic rates spike and burning up stored energy, Holt said, adding that it’s possible the same phenomenon could be occurring with killer whales, although it’s too early to know for sure. NOAA’s recovery efforts for the orcas include new regulations that will keep whale-watching vessels 200 yards from orcas, as well as efforts to reduce toxin pollution and to restore salmon runs. Longtime orca researcher Ken Balcomb feels it all comes down to the decline in salmon: “If you deny them the food, [there’s] basically no point in worrying about other factors,” Balcomb said. He calls the whale-watching limits “feel-good thing,” adding that “my observations over 35 years [are] that [whales] don’t really get disturbed by anything, much less vessels.” Holt acknowledges the limits of the new regs, saying that “a lot of people would argue, Why focus on these vessel regulations? But it’s one thing we can do immediately.” It appears to AEI that the question is not really whether the boat noise disturbs the orcas, but whether it may drown out parts of their foraging communication, making it more difficult for them to find and eat the few salmon that do remain available to them. And, given their tenuous situation, if they are forced to use more energy to call during hunting, their overall health is likely to be at least somewhat affected. Moreso, each time that a particular foraging attempt is aborted due to a noise intrusion, a larger bit of the daily energy budget has gone to waste. Time will tell whether the new boat limits actually lower the received sound levels for foraging whales; if so, it’s a step in the right direction. From the TNC article: Manes is certain that a national set of detailed maps overlapping wind and wildlife resources is crucial to “doing wind power right.” That is because the Conservancy and its partners have already implemented a system of maps in Kansas. And local developers have responded enthusiastically. Horizon Wind Energy even worked with the Conservancy and the Ranchland Trust of Kansas to set aside protected lands to offset the footprint of one of its wind-farm developments. “Our contacts in the wind industry said, Show us where we can develop our projects — so we did,” Manes says. The map shows the state’s native prairies, prairie chicken habitat, wildlife refuges and nature preserves, as well as where the best wind resources are. Now, when a wind developer wants to build in Kansas, the company knows which sites are likely to raise the ire of conservationists — and which areas aren’t. The Conservancy has created similar maps in a handful of other states, including Colorado, Montana and Oklahoma. And in mid-2009, the Conservancy was awarded a contract to create a wind and wildlife resource map for the entire country. The map initiative is funded by the American Wind and Wildlife Institute, a coalition of wind-industry and conservation organizations with the aim of reducing conflicts between wind development and wildlife. UPDATE: In the UK, the Royal Society for the Preservation of Birds, along with Scottish Natural Heritage, has initiated a similar project, centered on the production of a Bird Sensitivity Map for use in planning wind farms in Scotland. See this link for more information on the program, and click here to download the BSPB Bird Sensitivity Map Report. Scottish Heritage previously released “Strategic Locational Guidance” for onshore wind farms. While the province of Ontario appears to be onto something promising with its new Green Energy Act (see recent AEInews post), local wind skeptics point out that in recent years, the province has taken wind developers’ environmental assessments at face value. Citizens can request that the province conduct a full-scale independent assessment, and indeed, such requests have been put forward 31 times since 2006. In every instance to date, however, the request has been denied (nine are currently outstanding). Provincial authorities assure that the required private assessments include taking into account citizen concerns, and often involve mitigation, as part of “a lot of back and forth” between the companies and provincial regulators. Regarding noise issues (AEI’s primary concern), it would seem prudent to do some “ground-truthing” of industry sound propagation models: if there are instances in which neighbors are being affected by unexpectedly high noise levels, then future assessments should be sure to not use the same models that failed earlier. This is but one example of the value that even a few independent assessments could offer as the province moves forward with its ambitious plans to abandon coal-generated power. A great short piece in Canada’s esteemed Maclean’s magazine from early August highlights the aggressive push being made by provincial minister of energy to open up the province for wind power. George Smitherman, the self-styled “Mr. Wind,” may be on to something, because his initiatives are stirring up both anti-wind activists concerned about noise and health effects AND the industry itself, aghast at new setback requirements for large wind farms. New provincial set-back standards issued in June may well be just what this doctor ordered. While not going all the way to 2.5km (about 1.5mi), the new standards call for increasingly large setbacks for larger windfarms, peaking at 1.5km (just under a mile) for wind farms of over 26 turbines; smaller wind farms can be 550m away, loud small ones 950m away. The Canadian Wind Energy Association claims that these new rules will require changes in 96 of the projects, with 48% of their turbines out of compliance; 79 of the projects are now either “non-viable” or require “back to the drawing board” redesign. Smitherman is not phased by either side’s reactions. “I totally understand that there aren’t many people out there looking for more electricity infrastructure in their backyards,” he says. And if somebody has to go back to the drawing board and redesign some projects, “I apologize that it will be inconvenient in some circumstances. But bigger setbacks are part of the Green Act.” But he’s unapologetic about the larger goal, one that would be truly revolutionary: to eliminate coal-fired electricity by 2014—only five years away.